Barcode - The type of barcode to generate. Check Digit - Automatically generate the check digit of the barcode. If the barcode does not support Check Digit, this option will be disabled. Data - The data to be encoded as a barcode. Min Bar Width - Minimum Bar Width in Twips. 1 twip = 1/1440 inch. A typical value to start with for a 300 DPI image is 100. If set to 0, the minimum bar width will be automatically calculated based on the specified Width of the barcode. Bar Ratio - Thick to Thin Bar Ratio. A value from 2.0 to 3.0. This property only applies to the Code 39, Code 39 ASCII, Codabar, I2OF5 and ITF14 barcodes. Bearer's Bar - For ITF14 barcode only. Either a Top/Bottom or Rectangle Bearers bar can be selected. ITF Quiet Zone - ITF14 Barcode Quiet Zone. Values from 10x to 15x of the Min Bar Width are allowed. EAN Standards - Generate the ISSN, ISBN or ISBN 13 number when creating an EAN13 barcode. The number will be placed at the top/bottom of the barcode. Font - The font used to generate the Human Readable text. Size - The font size of the Human Readable text. Alignment - Align the Human Readable Text to the Left/Center/Right of the barcode. 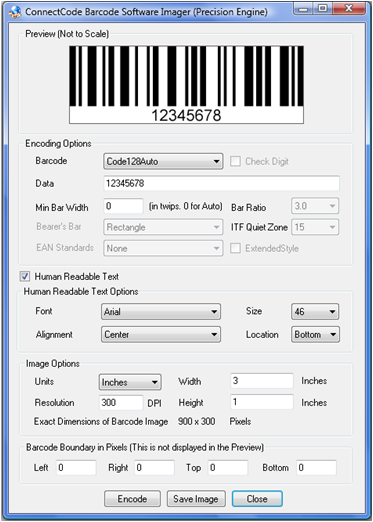 Location - Align the Human Readable Text to the Top/Bottom of the barcode. Width - Width of the Barcode in the units specified. Resolution - Resolution of the Barcode Image. We recommend 300 DPI as the minimum. Exact Dimensions of Barcode Image - The exact dimensions of the barcode based on the parameters above. For example, a barcode with 3 Inches in Width at 300DPI works out to be 900 pixels in Width. Boundary - Specify the amount of space on the Left/Right/Top/Bottom of the image. Encode - Generate a preview of the bacode image based on the options selected. Save Image - Save the barcode into an image file. You will then be able to insert the image into another Windows application for printing. Formats supported include Portable Network Graphics(*.png), Graphics Interchange(*.gif), Windows Bitmap(*.bmp)Tagged Image File(*.tiff), Jpeg (*.jpg), Windows MetaFile (*.wmf) and Enhanced MetaFile (*.emf). Close - Exit the Application.